The juggernaut that is the Marvel Cinematic Universe (MCU) has had quite the solid track record since it kicked off with Iron Man in 2008. Despite the occasional misstep, none of the films or television series that constitute the MCU have been met with a terrible reception. That is, until Iron Fist. Iron Fist is the final entry in the string of shows about street-level Marvel characters who will unite in The Defenders. Iron Fist, which centres on a billionaire named Danny Rand (Finn Jones) who is raised in a mystical monastery after surviving a plane crash that kills his parents, has faced a barraged of negative reviews. These have mostly focused on the show’s meandering pace, its failure to embrace the outre nature of its source material, and its problematic handling of race and culture. The character was created by Roy Thomas and Gil Kane, debuting in Marvel Comics in 1974. At the time, martial arts movies were starting to take off in the United States. It was fuelled in part by exoticism, and critics have called out how Danny spends most of the show explaining Asian philosophy to Asian characters. 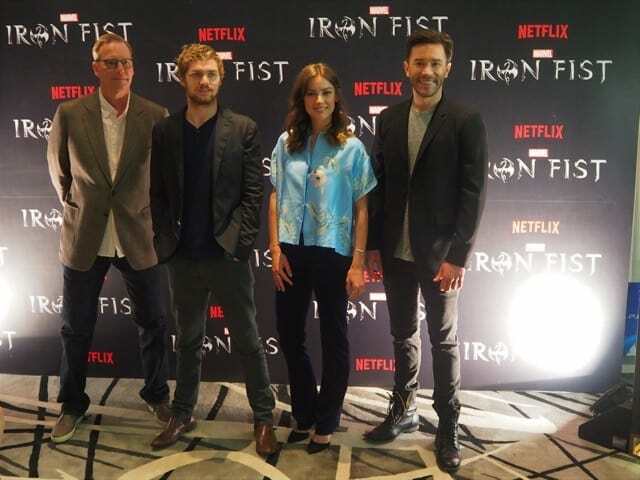 On the morning of Friday 31st March, stars Finn Jones, Jessica Stroup and Tom Pelphrey and showrunner/writer Scott Buck participated in a press conference held at the JW Marriott South Beach in Singapore. Deejays Shaun Tupaz and Melody Chen moderated the press conference, which notably did not include a Q&A segment, so journalists were unable to ask questions of their own. One-on-one and roundtable interviews were also not held. A Netflix representative clarified that this format was to fit more talent into the press tour, as it was earlier announced that only Jones would be flying in. Jones, who played Loras Tyrell in Game of Thrones, said that he heard about the auditions for Iron Fist on his final day of filming the fantasy series. He then underwent a “really intense process”, meeting with casting directors and executives in Los Angeles and doing a series of screen tests before clinching the role. Danny’s arc is one of self-discovery. Having led a privileged childhood and then having that violently rent from him after the death of his parents, Danny has been through the wringer. Training for 15 years in the inter-dimensional realm of K’un Lun, sometimes accessible via the Himalayan mountains, Danny earns the mantle of the Iron Fist. In addition to being an expert martial artist, Danny can concentrate his chi to manifest superhuman strength and impact in his fist, which glows when this power is activated. The siblings Ward and Joy Meachum are Danny’s childhood friends, who have thought Danny to be dead for the last 15 years, and are now running Rand Enterprises. Their father Harold (David Wenham) was the business partner of Danny’s late father, Wendell Rand. Joy believes her father has been dead for the last 12-13 years, when he has actually been holed up in a penthouse, manipulating events behind the scenes. Ward is aware of Harold’s secret, which he has had to keep from Joy for all this time. Pelphrey described what he found compelling about the character. “What is that like, helping a sibling through the grieving process of losing a parent when you know that’s not true?” he pondered aloud. “How does that break your heart or twist your soul?” Pelphrey reasoned that while Ward often seems like a selfish jerk, this is because he is caught in “kind of an impossible situation.” In response to Pelphrey’s questions about the character, Buck wrote the actor an email detailing Ward’s circumstances and his motivations. “In every scene, no matter how crazy he was being, or what big lies he was telling, or how sinister he seemed, it was able to come back to an equation wherein I, Tom, could figure out why Ward was doing what he was doing in the interest of his sister and himself, from a good place, not a bad place,” Pelphrey concluded. Another one of the show’s villains, Wai Ching Ho’s Madame Gao, is apparently not as scary in real life. “We loved working with Wai on the show. She’s such a sweetheart,” Pelphrey said of the 73-year-old actress, who reprises her role from Daredevil. Stroup and Pelphrey elaborated on the secretive casting process. Both were given dummy sides, or short sections of dialogue, and were not allowed to read full scripts until after they had been hired. “I set my goals for Netflix. It was pilot season for us in Los Angeles and I was just pushing everything away and wanted to work on a Netflix program to see what that platform was like,” Stroup said. After sending in their audition tapes, both Stroup and Pelphrey were called in to do an audition together. Stroup was taken aback by the scale of the production, including the sets of the Rand Enterprises offices and Harold’s secret penthouse. ““To me, it was breath-taking, the magnitude and how much detail had gone into it,” Stroup said. “It slowly dawned on me just what a huge project it was going to be, especially when (President of Marvel Television) Jeph Loeb said ‘these are the three best words you’ll ever hear: welcome to Marvel’. I was kind of in shock,” Stroup admitted. Pelphrey was similarly overwhelmed by being inducted into the sprawling MCU. He admitted to being star struck by one of the show’s guest stars. “One of my favourite movies of all time is The Matrix,” Pelphrey said. “When I saw in the script what was going to happen, then I arrived on set the day I got to work with Carrie-Anne Moss…meeting her was like…when I was a younger man, I had a very big crush on Trinity,” he confessed. Moss reprises the part of powerful lawyer Jeri Hogarth, a role she originated on Jessica Jones. “That was a big moment for me. I internally reverted to my 16-year-old self,” Pelphrey laughed. Tupaz and Chen presented each guest with a pack of Singlish flash cards, so they could learn the colloquial words and phrases that form Singapore’s English-based creole language. Pelphrey proved to be a fast learner, saying of the audition process “I still had no idea what the project was that they were talking about. I thought that they were siao (crazy) for asking me to do something when I didn’t know what it was. But at the same time, I was a little kiasu (scared of losing out), so I thought maybe I should look into it a little more.” The room roared with appreciative laughter. All 13 episodes of Iron Fist are available on Netflix.